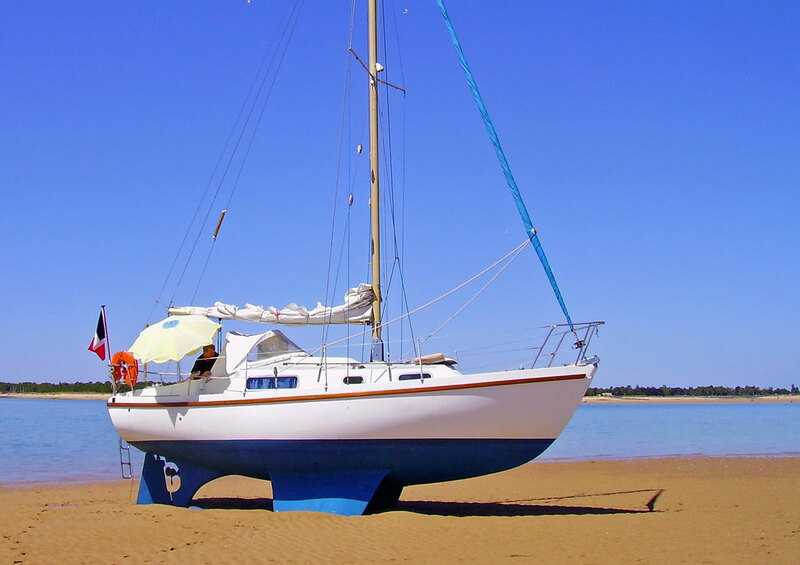 Is The Sailing Sloop the Simplest of All Cruising Sailboat Rigs? For ultimate windward performance, nothing beats a deep-fin keeled sailing sloop with a tall, high aspect ratio Bermuda rig (also known as a Marconi rig). 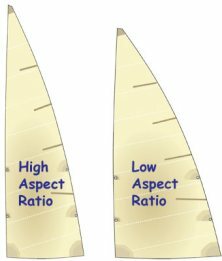 Low aspect ratio sails are short and squat while high aspect ones are tall and narrow, or long and narrow like the wings on a high-performance sailplane. But unlike sailplanes - which, being unrestrained by land or water, are always heading directly into the apparent wind - we sailors aren't always beating to windward. In fact most of us go to some lengths to avoid it if we can. Very high aspect ratio sloop rigs like the one shown here are only really appropriate for racing sailboats, where windward performance is vital for success. Such rigs rapidly lose their efficiency when even slightly off the wind, which is why successful racing sailboats carry an extensive sail wardrobe with sails to cater for all conditions. High Aspect Ratio - great to windward. Low Aspect Ratio - better off the wind. 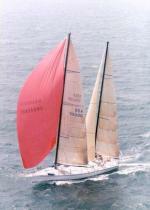 Sailing sloops with moderate rigs though, are probably the most popular of all cruising sailboats. 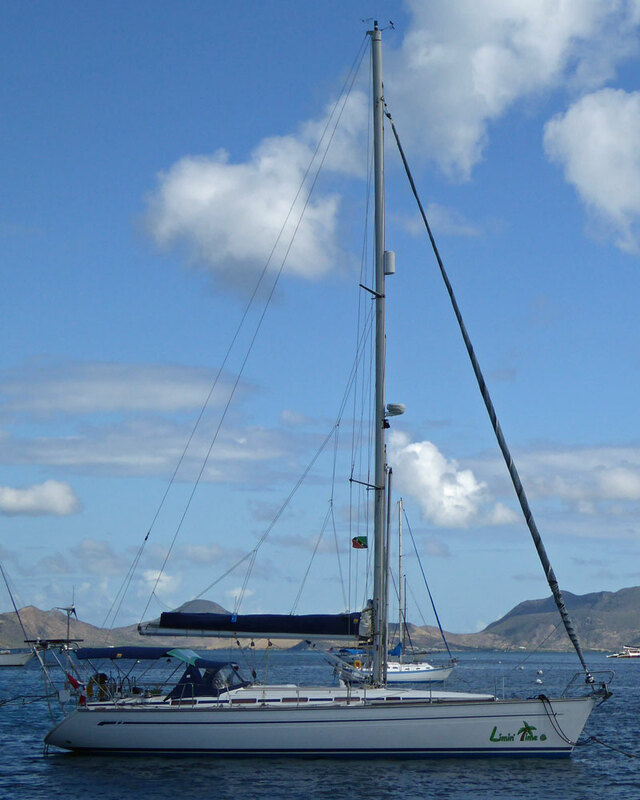 With just a single mast, two sails (a foresail or headsail, and a mainsail) and the minimum of rigging and sail control lines they are relatively simple to operate and less expensive than two-masted ketch rigs. There are two sailing sloop variants - masthead rigs and fractional rigs. 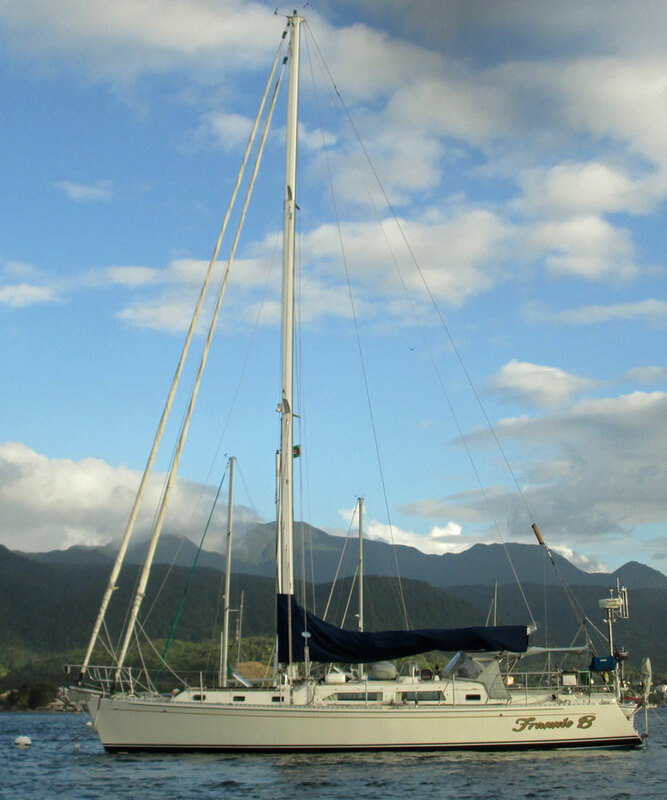 The masthead sloop is the simpler rig of the two, with the forestay attached at the top of the mast. 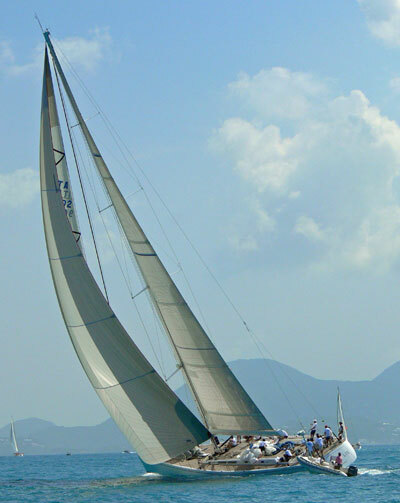 Foresails of various sizes can be set on the forestay, from small 'working' jibs through to large 130% deck-sweeping genoas. Incidentally, foresails are called jibs if the clew of the sail doesn't reach farther aft than the mast and genoas when it does. So the 'luff perpendicular' of a 130% genoa is 30% longer than the distance between the mast and the stemhead - known as the 'J' measurement. Deck-sweeping genoas such as these create a wide blind-spot off the leeward bow. Unwanted surprises and chance encounters will be far fewer if the clew is cut higher, providing forward visibility from the cockpit under the foot of the sail. 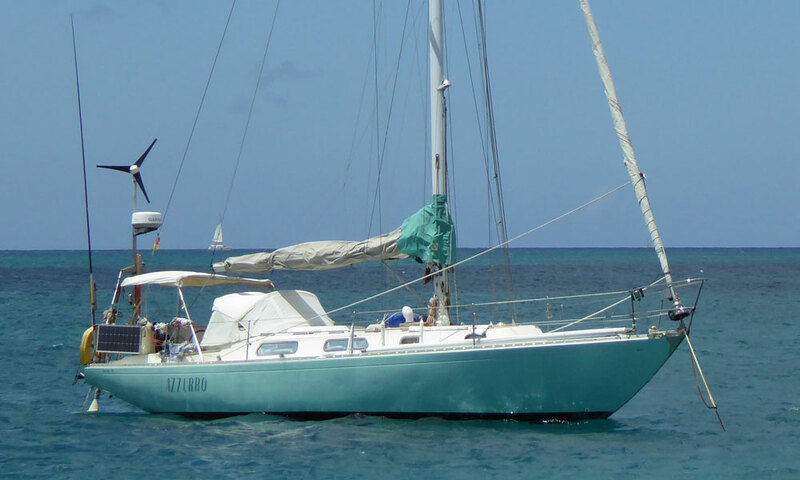 Nowadays however, the headsail is set on a furling gear, with the mainsail being either slab-reefed or equipped with in-mast or in-boom furling gear. 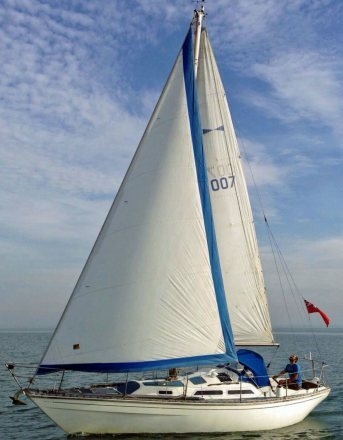 Also known as the Solent Rig, this arrangement shouldn't be confused with the cutter rig, where both foresails (a high-cut yankee and a staysail) can be set at the same time. With the double headed rig it's one or the other. The foremost sail will be the larger of the two - often a 150% genoa - and the other perhaps a jib that just fills the fore-triangle. With the larger sail set, it must be furled before tacking and only unfurled when the on the other tack. In rising winds the largest and most powerful sail is usually reefed first. On a fractional rig this is the mainsail. It's much easier and quicker to reef the mainsail than change the jib - though that's not the case if you have a sailing sloop with a roller reefing headsail. With the shorter hoist spinnakers are smaller and easier to control than the larger ones flown on masthead sloops. Downwind the larger main gives more drive, and it's not so important if the smaller jib is blanketed by it. 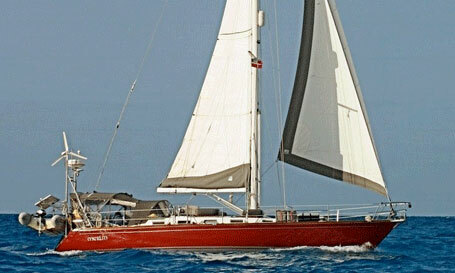 By tensioning the backstay, the mast is deflected forward in the middle sections, flattening the mainsail, and thus maintaining drive whilst reducing heeling moment. And of course there are downsides. The primary one is the requirement for running backstays to tension the forestay and keep the mast in column. These must be properly handled during tacking and jibing or you risk damaging, or even losing, the mast. 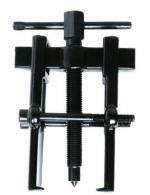 All offshore sloops should have the capability of rigging a temporary inner forestay for hanking on a storm jib. Set on the 'outer' forestay a storm jib can cause lee helm, which is really what you don't want in heavy weather. The inner stay is stored against the mast when not in use, and deployed by attaching to a strongpoint on the foredeck using one of the several tensioning devices designed for this purpose.